Ask Dr. Beckman: How Do I Eliminate and Prevent Split Ends? This may seem an odd question to ask a plastic and reconstructive surgeon but over the years I developed strong relationships with my patients and they felt they could ask me almost anything! I was happy to oblige an answer – as long as I actually had one! After being asked several times about split ends I decided to seek out a solution. That solution ended up being Theraderm’s Enriched Moisturizer! A lady’s hair and how it looks is a most important part of her overall appearance of beauty. Most problems with the hair itself can be successfully addressed at the beauty shop. One of the most common hair problems I have been privileged to discuss with patients over years of plastic surgery practice is hair that has “split” ends. This is damage to the hair itself. I have seen hundreds of ladies who are confronted periodically. The most effective solutions for any problem derive from a study of the causes and factors that create the problem. It is no different with hair ends. Sheep are able to have “hair” (wool) that remains soft, supple, and water-proofed, for warmth because of its lanolin content. Dry and compromised human skin responds equally nicely with natural lanolin oils to replace the skin barrier lipids that have been removed by frequent washing (doctors, nurses, beauticians, etc. ), or harsh chemical solvents in the workplace (mechanics), and even by those that have frequent hand contact with paper as part of their job. I have used lanolin in the my formulations of Therapon Skin Health products for over 20 years. Oils derived naturally from animal sources are able to completely penetrate and absorb into the skin. Neither vegetable oil (cocoa butter, corn oil), nor mineral based oils (petroleum, Vaseline) penetrate at all. After the first washing of hands “moisturized” with these oils, the dryness is there again. Several years ago I began having patients with hair having frayed “split” ends to restore soft luxurious hair using Theraderm Enriched Moisturizer on their hair once a week until the hair was restored. The process is quite simple and works every time. Wash hair using warm water and ½ teaspoon Theraderm Cleansing Wash. Slightly more water will cause a more “sudsy” feel. Then rinse hair and scalp well. While hair is still very wet, use ½ teaspoon of Theraderm Enriched Facial Moisturizer and apply to several places (4-6) on scalp. Work thoroughly and evenly into scalp AND hair and leave in place for 10 minutes. You may wrap hair in towel during this time. This moisturizer is lanolin enriched and restores natural oils to both scalp skin and hair. 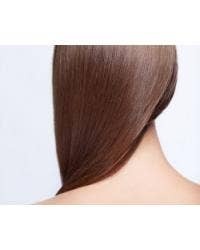 The benefits are to prevent/eliminate “split ends” in hair strands and to restore soft supple scalp that doesn’t itch. Now re-wash hair to remove excess moisturizer and dry with low heat or room temperature until dry. Repeat every 6-12 weeks if needed. Hair should gain luxurious texture, softness, and shine. The scalp should stop having flakes, itching, or irritation!